What the 5 most common regrets of the dying are. 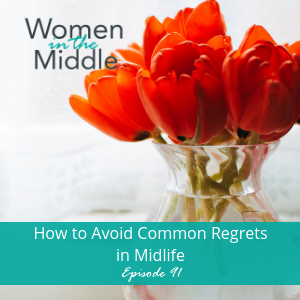 Why it’s important to understand common regrets in midlife. Why it’s important to think about regret-proofing. What “regret-proofing your life” looks like. Why friendships are important now and later in life. Why it’s important to understand that happiness is a choice you can make. This week we’re taking a look common regrets in life and what you can do to prevent them. Bronnie Ware cared for people in palliative care and after years of working closely and developing meaningful relationships with people who were dying, she realized that the way they talked about their regrets fell into five key themes or categories. She shares insights that you can learn so much from. Knowing what these common regret-related themes are can help you take specific actions to make sure you don’t also have these regrets. One thing’s for sure, everyone regrets having regrets. Do what you can to live a life free of them!